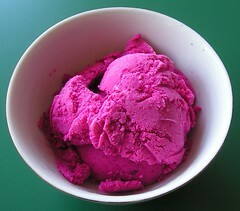 Beet Ice Cream - Do You Know The Muffin Man? Notes: Recipe calls for 3 “large” beets: a large beet is about 8oz/220g? Made a half recipe (about 3/4 quart) because I only had a handful (8 oz) of small beets. Roasted beets in a loosely covered shallow pan with a little water for about an hour and strained most of purée through sieve. Used all half-and-half (10%) cream. Cut the egg yolks by one third (so 4 yolks for half recipe). Omitted cayenne and cinnamon. Tastes just like beets, an interesting and unusual ice cream for sure.